Flowers float in painterly profusion across a deep blue background on this hand-printed cotton kimono. 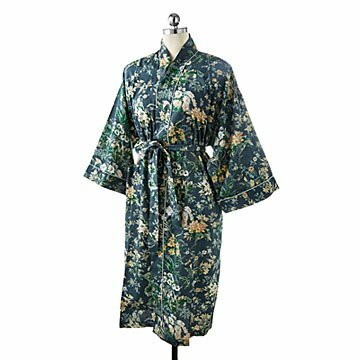 Painterly flowers, leaves, and stems float in lush profusion across a deep blue background on this lovely, hand-printed robe. Lightweight cotton voile with a soft sateen finish gives the evocative floral print a casually luxurious feel. Stunning, comfy, and practical, it has two front pockets, is machine washable and dryable, and packs small for travel. Belt included. Handmade in India.